Hi Andy! Thanks for posting your comment! You know, it's really inspiring for me and for the developers to get such positive reports from the "battlefield". Huge thanks and all the best with your search engine optimization! 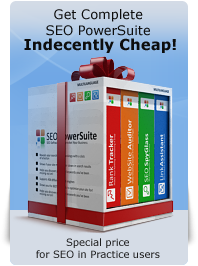 I've just started following your book and using the SEO Powersuite. I've just played around with "link assistant" and spent a couple of hours filling in submission forms and got about 30 or so reciprocal links. This morning I checked my ranking expecting it to be much the same (position one on page three) where it's been for the last six months. Imagine my surprise when I saw it sitting at number eight on page one of google! I've tried all sorts of books and tools to help move my ranking and this is the first that's worked. I'm now an avid convert to your way. Thanks for this book and the software! It's sound great. Now I do love to learn SEO. Thanks. Thanks for the great resource. I ordered your SEO Power Suite software last week. I have been studying SEO for the last few months and honestly was really starting to get overwhelmed with everything. This guide was exactly what I need. Someone that knows what they are doing to tell me, do this, this and this. I am looking forwarding to reading the rest of your book over the next few days. O.K. Sounds to good to be true, but I am an explorer and like intuitive learning. I'll give it a shot. At last I found valuable and suitable course for me. You did really great job.That is exactly what I need - easy step-by-step guide without uselles, sophistacated ideas. Thank you so much for this book. There is too much info out there on the topic of SEO and for someone who needs to make money, but has a limited budget to start, Adwords is just too expensive. It's great to know I can put this info into practice and it will work, as opposed to trying all sorts of crazy things with no results except time wasted. It's a great informative book. I am doing job in SEO company. We prefer this book to get SEO related knowledge. This book provide easy content to learn SEO from beginning. Sorry, the book is now only available online. Although we're working at a PDF version it will hardly be released earlier than within a few months. I do hope that you will take some time to read SEO in Practice online and implement its advice for optimization of your own websites.